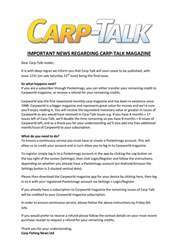 This week’s issue of Carp-Talk (issue 1009) is available to download now! 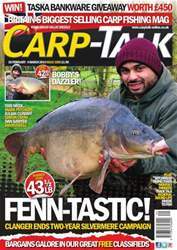 Warren Fenn’s capture of Silvermere’s Clanger leads the news stories this week, with the professional boxer getting his fish after a two-year pursuit. We have also got a 47¼lb mirror from Wintons’ Kingfisher Lake, a 42lb 10oz common from Papercourt and a 40lb 6oz mirror from Olivemead. 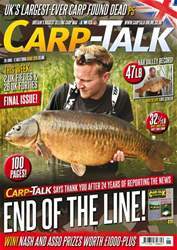 Julian Cundiff talks time constraints in ‘It Only Takes a Minute or Two’, and ‘Where to Fish’ returns, featuring reviews of A1 Pits, Tanyard, Fisherwick, Layer Pits and the River Ebro. 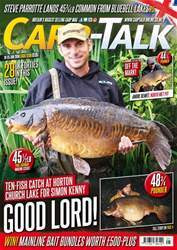 Mark Pitchers has got five February edges, and Ian Russell details the hook swivel rig. 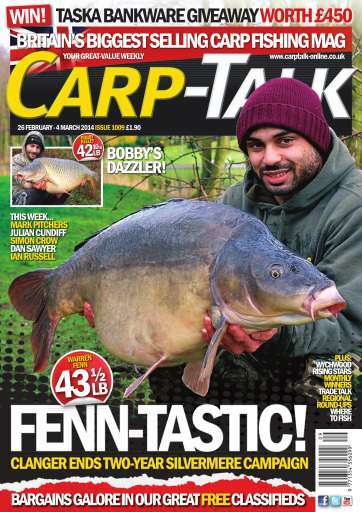 Products from Avid Carp, Shimano, 30Plus, Taska, Steamies, Venture and Fox go under the spotlight in ‘Trade Talk’, Dan Sawyer continues his ‘A Season for Change’ feature and Simon Crow reveals how he juggles work and personal life to make time for fishing. Not only that, we’ve got £450 of Taska products to give away, the monthly winners of the Nash and Richworth competitions, and ‘Wychwood Rising Stars’.